Hi, my husband and I were looking at a 104 year old farm house to buy recently in Portland, New York. It was about mid-day and I was just taking snap shots of the yard which was about 9.4 acres. There is an old orchard and a stand of trees on the outer edges of the property. Both my husband and I got a sense of deep inexplicable cold the whole time we were there. It literally chilled us right down to the bone. We consequently didn't get a good feeling about the house so we soon left with no interest what so ever in the house which was in a great state of disrepair. 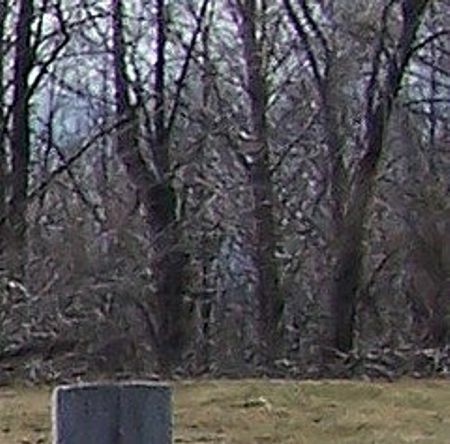 Once we got home though upon reviewing my photos I came across an amazing apparition standing just within the tree line on this property. It seemed to both my husband and I to be of a Victorian dressed man with a cane in his left hand standing in front of a gowned woman as if he was protecting her. It was a startling find to say the least. If you see the post in the lower left corner of the picture then go behind it to a large tree there is a space between this tree and the next tree to the right. Hi my name is Heather, I live in Westfield, NY, not very far away from Portland. I was wondering where this place is located exactly. I would like to visit the place and see if I get the same feelings as I am a big believer in ghosts and the supernatural. If you could send me an email to hhouser19 @yahoo.Com stating where it's located I'd appreciate it, it really interests me thanks.